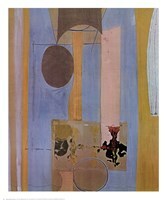 Robert Motherwell, an American painter, began his career as an associate professor at Hunter College in New York. He took up painting seriously in 1941 and became one of the pioneers of American Abstract Expressionism. The American Abstract Expressionist movement developed in New York during the 1940s. It differed from its European counterpart in that the abstraction did not depend on an object or on nature. It was both the subject and the object of the painting. Motherwell's paintings are bold and simple and, unlike his contemporaries, often symbolic. His works were inspired by literature, history and his personal life. Additionally, many of his paintings were reflections of his reaction to the Spanish Civil War. His series, "Elegy to the Spanish Republic," is made up of over 100 paintings and strongly projects his own personal philosophy, as well as his political opinions about the war. Late in his career, he practiced a new technique, "color field painting" which was developed by his wife Helen Frankenthaler. The effect was achieved by staining the canvas with a thin wash and painting darker forms on top.